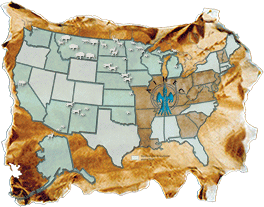 Tribal Colleges and Universities (TCUs) are chartered by their respective tribal governments, including the ten tribes within the largest reservations in the United States. They operate more than 75 campuses in 16 states—virtually covering Indian Country—and serve students from well more than 250 federally recognized Indian tribes. TCUs vary in enrollment (size), focus (liberal arts, sciences, workforce development/training), location (woodlands, desert, frozen tundra, rural reservation, urban), and student population (predominantly American Indian). However, tribal identity is the core of every TCU, and they all share the mission of tribal self-determination and service to their respective communities. These academically rigorous institutions engage in partnerships with organizations including U.S. Department of the Interior, U.S. Department of Agriculture, U.S. Department of Housing and Urban Development, the National Science Foundation, National Aeronautics and Space Administration, and universities nationwide to support research and education programs that focus on issues such as climate change, sustainable agriculture, water quality, wildlife population dynamics, and diabetes prevention. Many support distance learning involving state-of-the-art learning environments. TCU faculty are engaged in research in many areas including: hydrology, molecular cell biology, archaeology, entomology, community health, environmental science, aerospace engineering, and advanced manufacturing processes. The majority of faculty, teaching staff, and administrators hold a master's or doctoral degree. Dedicated faculty and staff often serve double-duty as counselors and mentors in addition to their teaching and administrative roles. TCUs provide many services to help students stay in school and complete their studies, such as personal and career counseling, mentoring, tutoring, wellness programs, child care, lending of laptop, and transportation and housing assistance. Community members often take advantage of the TCU libraries and computer labs, as well as a range of community service programming, such as business incubators and healthy lifestyles awareness events.